Ever thought of making your friends to listen to what you are listening to?? Just to make them listen to your music , your MP3 ... Now that almost every user uses one or another Instant Messenger this thing gets simple and you can make your friends listen to your music. And believe me it requires no external tool or software. You get the recording menu. 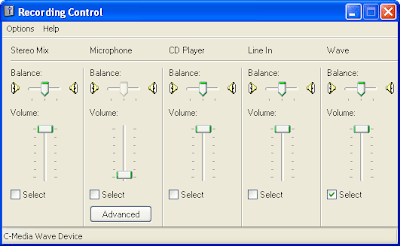 In the recording menu select either Stereo mix or Wave and not the microphone. Fire up your favorite Instant Messenger program and call any of your friend. Whoa you are broadcasting your music. So your favorite messenger like Yahoo, Gtalk , MSN , Skype or whatever becomes your broadcast engine and that too without any external tool. The reason why we chose to unplug the Mic because many times in recording options the selected options changes from 'Stereo Mix' or 'Wave' to 'Microphone' and you don't want your friend to listen to any of the stray sounds . and this trick. Try it.